Fasten your space belts for another blast to the future with Futurama, the irresistibly irreverent brainchild of "The Simpsons" creator Matt Groening. This 4-disc set includes 22 robot-packed episodes, plus a shipload of outrageous extras. So join Fry, Bender, Leela and the gang for more of the funniest animated adventures on the planet ... and beyond! Futurama won’t approach the longevity of its sibling series, The Simpsons. In fact, it seems very likely that this Volume Three will be its penultimate DVD release; unless some sort of Family Guy style miracle occurs, the series is dead as far as new episodes goes. Enough material remains to make up one more DVD package, and that’ll be that. Which is too bad, for the series was quite good. It never achieved the immense highs of The Simpsons, but it worked very well as a whole. So without further ado, let’s check out the 22 episodes on Volume Three of Futurama. I’ll examine each of these programs in the way presented on the DVDs, which also corresponds to their production numbers but not airdates. Sometimes these vary radically, as the shows first aired over a wide variety of dates. 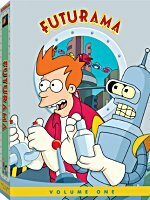 The synopses come from an excellent site called “Can't Get Enough Futurama“ (http://www.gotfuturama.com) - thanks to them for their permission to use the recaps. Amazon Women in the Mood (aired 2/4/01): When Zapp Brannigan (voiced by Billy West), Kif (Maurice LaMarche), Leela (Katey Sagal), Amy (Lauren Tom) attempt to rescue Bender (John DiMaggio) and Fry (West), they crash onto Planet Amazonia. There the crew discovers the planet is inhabited by a race of giant women who have found that life without the male gender is preferable. These Amazonian women worship a Femcomputer (Bea Arthur) who sentences Fry and the rest of the guys to death. It is up to Bender - a manbot and technically not a man - to intercede on the guys' behalf. Meanwhile, Kif professes his love to Amy. A generally positive episode, “Mood” starts this set well. Most of the humor comes from the mockery of gender stereotypes. Of course, the show doesn’t really attempt to dispel any of these. Instead, it laughs at them, especially in the ways of the Amazons. Add a fine guest vocal performance from Bea Arthur as the Femputer and “Mood” is a good one. Parasites Lost (aired 1/21/01): When Fry eats an egg-salad sandwich from a vending machine at a gas station, he begins to have strange side-effects -- he becomes stronger and smarter. Professor Farnsworth (West) makes a diagnosis and concludes that Fry had ingested "intelligent worms" that have set up shop in his body. Because these worms are so smart, the regular means of flushing them out will not work. The Planet Express crew must shrink themselves to microscopic form and enter Fry's body to fight off the intruders. Meanwhile Leela is left to divert Fry's attention, but finds herself more and more attracted to the new man Fry has become. We go the Fantastic Voyage route in “Lost”, and it functions reasonably well. While not as funny as “Mood”, it earns points for cleverness, and it does go down some entertainingly improbable paths. Overall, it stands as a fine program. A Tale of Two Santas (aired 12/23/01): Bender is declared the new Santa when it is discovered that the evil Santabot (DiMaggio) has been frozen in a block of ice on Neptune. But when Bender begins delivering toys, the citizens - who are unaware that Santa is now a good guy - stage an all-out assault against him. Just when things can't get any worse, the evil Santa's icy tomb thaws and he escapes to exact his wrath upon the world. The robot Santa seemed like a fairly inspired character when he debuted in Volume 2. However, he comes back in a pretty uninspired episode here. “Tale” includes some decent gags, but it feels scattershot and disjointed. Ultimately, it comes across more like a collection of bits without a clear sense of cohesion, which makes it pretty average, even with the Kwanzaabot. The Luck of the Fryrish (aired 3/11/01): After a string of bad luck, Fry remembers back to when he was growing up in New York and his older brother, Yancy (Tom Kenny), was stealing his good ideas -- until the discovery of a rare seven-leaf clover that reversed Fry's luck. Now in the year 3001, Fry sets out in hopes of regaining his luckier days by recovering the charm from the underground ruins of Old New York and the family homestead. But strong-minded Fry becomes incensed with his unexpected discoveries. “Luck” presents better gags than in “Tale”, and its flashbacks provide some fun moments. Fry’s Commie-hating dad seems especially amusing, and it’s interesting to get some character back-story. However, the episode goes awfully sentimental at the end, so much so that it seems out of character for Futurama. The Birdbot of Ice-Catraz (aired 3/4/01): The Professor decides to ship hazardous cargo to the outer reaches of space, but the course charted takes the ship through some environmentally sensitive areas-- including the penguin refuge on Pluto. Leela refuses to transport the dangerous cargo, so the professor removes her from command and installs Bender as captain. While Bender is piloting the ship, he allows his attention to drift and accidentally showers the penguins with oily goop. Environmentalists make a pretty easy target, and “Birdbot” takes good advantage of those elements. Perhaps the show’s best moment comes from its depiction of the oil-covered birds, with goofy sound effects added “to lessen the tragedy”. Any show in which Bender impersonates a penguin can’t be too bad, and “Birdbot” offers a reasonable amount of fun. Bendless Love (aired 2/11/01): When a sleep-walking Bender causes havoc on Planet Express by indiscriminately bending things in the middle of the night, Professor Farnsworth becomes bent out of shape and sends him off to the Bending Factory where his uncontrollable need to bend becomes controlled. There, he is re-united with Flexo (DiMaggio) and meets Anglelyne (Jan Hooks), a curvaceous fembot, and sparks begin to fly. The return of Flexo helps propel “Love” into positive territory. In addition, Jan Hooks’ unexpected take on Anglelyne makes her a funnier character than I anticipated. Bender-centric episodes usually work well, and “Love” falls into that territory. The Day the Earth Stood Stupid (first aired 02/18/01): The Earth is conquered by flying brains with the power to turn normal human beings into idiots. On a distant planet, Leela learns that humanity's single hope is Fry -- the only being immune to the brains' moron-making power. So Leela must return and enlist Fry's help without becoming an imbecile herself. Any episode with the Hypno-Toad can’t be bad, and “Stupid’ includes some other good moments as well. We learn more about Leela’s pet Nibbler, and we see great material when everyone on Earth gets dumber. We even get to visit Nibbler’s home planet in this terrific show, one with a wonderfully surreal climactic sequence. That’s Lobstertainment! (first aired 02/25/01): Dr. Zoidberg (West) tries his luck as a part time comedian, much to the dislike of his audience. He decides to get professional help from his elderly uncle, the formerly famous Harold Zoid (Hank Azaria). Zoid sees no comedic talent lurking within Zoidberg though, and he decides to go with drama. They get “All My Circuits” actor Calculon (LaMarche) to do a main role by promising him an Oscar. I never thought much of Zoidberg, but “Lobstertainment” uses him nicely. Even if it offered nothing more than the Harold Zoid silent short, it’d be a good episode, but it goes beyond that. Hollywood parodies are a dime a dozen, but this one gives enough fun twists to make it a winner. The Cyber House Rules (first aired 04/01/01): When Leela rushes to the reunion of the Orphanarium where she grew up, she reunites with Adlai (Kenny), a plastic surgeon who can give her the appearance of two eyes. With terrible childhood memories of her strange Cyclops look fresh in mind, Leela is convinced to undergo the surgery, while Adlai is convinced that Leela is the only one for him. Meanwhile, Bender petitions to adopt 12 orphans in order to receive a government stipend for which he has big plans. Daddy Bender and Leela see things in a new light. “House” has its moments, but it feels a little like an “Afterschool Special” about acceptance at times. Okay – “Afterschool Special” is a bit extreme, as the show never approached that level of sappiness. Still, it comes across like a lesson in being who you are too much of the time, and that overcomes some of the comedy. It’s got enough entertaining bits to succeed, but it’s not one of the set’s better shows. Where the Buggalo Roam (first aired 3/03/02): When Amy brings her most recent boyfriend Kif home to meet the family, trouble ensues when Amy's parents fear that Kif cannot provide many grandchildren. Amy's parents - who own half of Mars and made a fortune off raising buggalo, an alien version of cattle - set out to break-up the relationship. When an entire herd of buggalo suddenly disappears, Kif offers to go after the rustlers and enlists the help of Professor, Zapp Brannigan, Fry, Leela, Hermes (Phil LaMarr) and Bender. Back at the homestead, Amy's parents make some interesting discoveries. Arguably the most minor of the minor characters, Amy remains the least interesting of the regular personalities. That leaves something of a void in “Buggalo” that the show doesn’t quite overcome. Kif’s an okay role, but he also can’t carry the program. At least some surprisingly amusing bits from Zoidberg as a terrible house guest add a little spark to an otherwise fairly bland program. Insane in the Mainframe (first aired 04/08/01): When Fry and Bender are mistaken as bankrobbers, they are sentenced to time in an insane asylum for robots. Bender, of course, sees it as a vacation, but Fry begins to crack under the pressure of mechanical examinations and a diet consisting of motor oil. 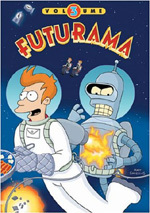 Fry soon becomes convinced that he too is a robot and is declared cured and released back to New New York. Bender and his new partner in crime Roberto (LaMarche) escape from the asylum and attempt to rob a bank only to find the cops waiting to bust them. On the lam, the seek refuge on the Planet Express and take the crew hostage. After a couple of weaker episodes, “Insane” rebounds nicely. It takes advantage of a bunch of comedic opportunities, such as at the asylum and with Fry’s delusions, and it doesn’t usually go down the predicted paths. Sure, we get a little Cuckoo’s Nest, but not to the predictable extreme. Roberto’s a great new character, and this is a solid program. The Route of All Evil (first aired 12/08/02): Cubert (Kath Soucie) - the clone of the Professor - and Hermes’ son Dwight (Bumper Robinson) are suspended from school for illegal use of the AV equipment. Upon their return to the Planet Express, they form a business -- a competing delivery company that threatens the existence of Planet Express. Meanwhile, Leela, Fry and Bender brew up a batch of homemade beer. A show with a pregnant Bender – misshapen with beer – may sound gimmicky... and it is. But it’s also pretty funny. Those elements take some obvious paths, but they still come across as amusing. It’s also pretty entertaining to watch the competition between Planet Express and Awesome Express, and these parts add up to a pretty solid episode. Bendin’ In the Wind (first aired 04/22/01): Bender no longer lives up to his name after an unfortunate accident, but instead makes a new name for himself when rock star Beck offers him an opportunity to live out his folk-rock dream. As a result, Bender's attempt to showcase his humanistic endeavors fails when he's faced with a bittersweet realization. Meanwhile, the rest of the crew gets a taste of the '60s. “Wind” tries to parody both hippies and rock stars, but it doesn’t do well in either regard. The show hits some pretty obvious targets and never really starts to take flight. It presents a few amusing moments but seems lackluster as a whole. Time Keeps on Slipping (first aired 05/06/01): In the 30th Century, the once entertaining Harlem Globetrotters are now feared as they will humiliate any planet in the universe who dares to play them. Feeling up to the challenge, Professor Farnsworth creates a group of mutant basketball players to go head-to-head with the Globetrotters. Farnsworth's secret winning ingredient is chronitons, time particles found in the Tempus Nebula. However, when the Planet Express crew removes the mutants from harvesting, they tip of the Time/Space Continuum causing forward motion of time to skip ahead. One of the more surreal episodes, the time jumps create lots of great gags. None of it makes a lick of sense, but who cares? It’s a fun program made even more bizarre due to the nonsensical presence of the Globetrotters. It also presents a sad ending that works and doesn’t come across as overly sentimental or sappy. I Dated a Robot (first aired 05/13/01): Fry falls in love with Liubot (Lucy Liu), a virtual humanoid downloaded from a computer. Disapproving of Fry's affair with a virtual woman, Bender and Leela steal the original head of Lucy Liu from the internet company, Nappster.com, where she is being held against her will. Seeking revenge, the Nappsters unleash a mob of illegal Lucy Liu downloads to take over the city. ”Robot” doesn’t function as a great show, but it mostly works well. You can’t go wrong with an army of homicidal Lucy Liubots. It’s not packed with laughs, but it’s consistently creative and amusing. A Leela of Her Own(first aired 04/07/02): When Leela is signed to the New New York Mets, she is thrilled to be the first female major league blernsball player. Drawing huge crowds at the games, Leela believes she is an inspirational role model to all women. What she doesn’t realize is that she has such a following because she is the worst blernsball player to ever play the game. Some episodes sound better on paper than on the screen, and that’s where “Own” falls. It’s a fun concept but that’s about it. The show itself musters the occasional giggle and seems watchable. However, it comes across as pretty mediocre, even with a fun voiceover from the great Hank Aaron. A Pharaoh to Remember (first aired 03/10/02): After delivering an enormous sandstone to Osiris 4, Fry, Leela and Bender are forced to work as slaves assisting the construction of the great Pharaoh Hamenthotep's tomb: a pyramid. When Bender experiences an identity crisis because he has never been an over-achiever, he becomes extremely motivated, working harder and faster than anyone for the completion of the tomb. While the Pharaoh acknowledges the crew's diligence, Bender's efforts accidentally kill him, and Bender proceeds to the throne. The tonic for a bland episode like “Own”? A little patented surliness from Bender, who acts at his worst here when he feels unappreciated. The Egyptian-style society on Osiris 4 seems kind of gimmicky, but it still musters more than a few funny bits and “Remember” ends up as a pretty good show. Anthology of Interest II (first aired 01/06/02): Three stories unfold when Professor Farnsworth fine-tunes his "What If" machine: Bender discovers how different he would be if he were human, Fry learns what life would be like if it resembled a video game and Leela wonders what would happen if she found her true home... and crash lands on Planet Ozz on this episode. Although the original "Anthology" from Volume 2didn't do much for me, this one works pretty well. Both of the first two bits seem quite funny. Obese Bender is a hoot, and the video game allusions in part two are also very amusing. The Wizard of Oz spoof in part three falters somewhat, but it has its moments. Overall, the second "Anthology" fares well. Roswell That Ends Well (first aired 12/09/01): An accident causes a supernova that sends the crew back in time to 1947, where they land in Roswell, Area 51. Fry and Bender's head have to go in for a rescue mission to free Dr Zoidberg and Bender's body from an army base where Fry's grandfather Enos (West) works. “Roswell” features a very Back to the Future take on things, but it manages to become more than just a simple spoof of that flick. Probably the best elements come from the interrogation and examination of Zoidberg, which offers some very funny moments. It’s not a stellar episode, but it’s a good one. Godfellas (first aired 03/17/02): When Bender is accidentally swept away into a space vacuum, he becomes spiritually inclined and makes some devastating decisions. Meanwhile, Fry, Leela and Professor Farnsworth frantically search for Bender as he floats through space and learns an important lesson from his journey. Parts of “Godfellas” remind me a little too much of the Simpsons Halloween episode in which Lisa becomes god to a society that blossoms on her discarded tooth. Nonetheless, the show seems generally creative and intriguing. It gets a little drippy at times, but it’s still an interesting piece with enough humor to make it work. Future Stock (first aired 03/31/02): At the annual shareholders meeting, Fry meets a 1980s Wall Street power player and ultimately nominates him to replace Professor Farnsworth as the CEO of Planet Express. The new CEO appoints Fry as Vice Chairman and differences are quickly discovered when the strategy is to sell off the Planet Express Company. A mutinous Fry realizes the bona-fide value of the enterprise and attempts to restore the original regime. Nothing says comedy like Eighties references, and “Stock” packs in a bunch. It gives us a Gordon Gecko look at the business world and tosses out a lot of fun moments. Overall, this one works as an above average program. The 30% Iron Chef (first aired 04/14/02): Bender attempts to become a chef, and is quickly rejected by the Planet Express crew. He then turns to the chef that inspired him, Elzar (DiMaggio) who also rejects him. Bender soon makes friends with some space hobos and, coincidently, one of them is Helmut Spargel, formerly the world's greatest chef. Helmut takes Bender under his wing and trains him to be a master chef by giving him a secret weapon -- a crystal vile containing "the pure essence of flavor". A now confident Bender challenges Elzar to a competition in the televised kitchen coliseum known as the "Iron Cook" show. One thing I know to be true: Futurama relies on way too many Soylent Green jokes. Still, an episode that highlights both Bender and Zoidberg – who maintains the “B” plot – can’t be too bad, and “Chef” mostly comes across well. Actually, the “B” story is the funnier of the pair, but both are good. As I noted when I reviewed Volume Two, Futurama didn’t experience the growing pains seen in The Simpsons, as the earliest episodes still work very well for the most part. Nonetheless, the series did improve as it progressed. The difference between Season One and Season Three isn’t as extreme as what we saw for The Simpsons, but it does exist. That comes mostly from the consistency of the shows. Without question, Volume Three demonstrates the highest general caliber of programs of the first three sets. Of course, a few moderate clunkers occur, but we find fewer than in the initial two packages. Overall, it’s a good set that provides a lot of fine entertainment. 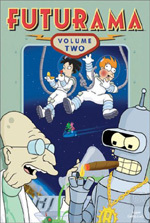 Futurama Volume Three appears in an aspect ratio of approximately 1.33:1 on these single-sided, double-layered DVDs; due to those dimensions, the image has not been enhanced for 16X9 televisions. The first couple of packages presented solid visuals, and Volume Three continued that trend. Volume Three of Futurama closely duplicates the extras found on the first two sets. The big attraction here stems from audio commentaries for all 22 episodes. These tracks present an ever-changing roster of participants, though a few constants occur. On all 22 commentaries, we hear from writer and creator Matt Groening and writer and executive producer David X. Cohen. Supervising director Rich Moore shows up for all except “Time Keeps on Slipping” and “Godfellas”. In addition, we greet others intermittently. The tracks feature actor John DiMaggio (1, 4, 5, 6, 7, 8, 9, 10, 12, 13, 14, 16, 17, 18, 19, 20, 21, 22), director Peter Avanzino (2, 11, 15), writer Ken Keeler (14, 20), writer Eric Horsted (6, 13), director Brett Haaland (8. 18), actor Billy West (1, 4, 5, 6, 7, 9, 10, 12, 13, 14, 17, 18, 19, 20, 21, 22), director Brian Sheesley (1, 7, 12, 21, 22), writer Bill Odenkirk (3, 11), editor Paul D. Calder (), director of computer graphics Scott Vanzo (2, 3, 15), writer Patric M. Verrone (8, 16), writer J. Stewart Burns (10, 19), writer Lewis Morton (1, 9, 18), director Susan Dietter (9, 14, 19, 20), writer Eric Kaplan (2, 15), director Ron Hughart (3), actor Maurice LaMarche (1, 9, 12, 18), actor Tress MacNeille (7, 21, 22), writer Ron Weiner (4, 17), writer Dan Vebber (5, 12), director Swinton O. Scott III (6, 16), writer Jeff Westbrook (7, 21, 22), and director Pat Shingawa (10). The commentaries during the first two sets were pretty erratic, and that trend continues here. A fair amount of dead air occurs, and at times, the speakers do little more than identify who performs various voices. Many of the comments also just praise the shows and talk about what they like. General and specific factoids pop up at times, but one can’t expect to get a great feel for the production here. Despite that fact and all the dead air, I enjoyed the commentaries. They become irreverent and remain fun much of the time. In fact, it’s often more entertaining to hear the participants go off task and discuss somewhat irrelevant topics. The voice actors eagerly break into character at times, and this results in fun. One track even features a competition to identify the real Zoidberg, as three performers give the voice a go. If you don’t really dig the series, you probably won’t get much out of these admittedly mediocre and sometimes lifeless tracks, but I liked them, and they offered enough enjoyment to make them worth the time. Next we find a series of deleted scenes. 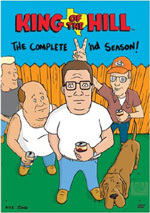 The DVDs include unused material from all the episodes except “The Route of All Evil”, “Bendin’ In the Wind”, “I Dated A Robot”, “Anthology”, and “Godfellas”. 17 shows with unused material? Cool! We get extensions of existing scenes, alternate versions, and a few totally new snippets. These run between 11 seconds and 137 seconds for a total of 16 minutes, 40 seconds of footage. Some of the clips are blah, but most seem quite good; we find a lot of nice material here. On DVD One, we get storyboards for “Parasites Lost”. These cover the entire program on screens that usually display three drawings. That makes them awfully small, and they can be somewhat hard to make out at times. Nonetheless, it’s a neat addition to the package. DVD Four tosses out a few additional components. Most significantly, we find an Alternate Audio Commentary for “Roswell That Ends Well”. This includes Groening, Cohen, Moore, producer for Rough Draft Studios Claudia Katz, and director of computer graphics Scott Vanzo. They decided to add another track after this episode won an Emmy, and they wanted to give it a more technical bent. A discussion of animation dominates this track, though some of the usual irreverence appears. It’s not a great commentary, but it adds some decent notes. In 3D Models From Rough Draft, we get nine subjects. These include looks at the basic 3D art plus comments from Scott Vanzo and the others who sat in the alternate audio commentary just discussed. We see “Mom Corp. Ship” (34 seconds), “Robot Arms Neighborhood Backlot” (19 seconds), “Robot Santa and Sleigh: Turnaround” (21 seconds), “Titanic Spaceliner” (30 seconds), “Hover Convertible” (26 seconds), “Buggalo Walk Test” (16 seconds), “Tornado: Wireframe to Final Color” (17 seconds), “Nibbler’s Ship: Turnaround” (seven seconds), and “VW Van: Wireframe to Final Color” (33 seconds). It’s fun to get a look at the layers of the work, and the commentary helps explain it all nicely. After this we find an animatic for “Anthology of Interest II”. It shows a roughly animated version of the program; for audio, it comes mainly with dialogue, as only a little music and effects appear. It’s a cool way to check out an early version of the episode, especially since we get to see some differences between this conception and the final product. Not only do some deleted snippets appear, but we also hear rough voicework at times; this means a man performs as Amy! The Still Gallery/New Character Artwork includes 56 screens of drawings. These show what one might expect: drawings of characters not previously featured on the series. That includes younger Fry and the others from Nibbler’s planet, all of whom look a lot like Nibbler. International Clips simply shows one scene from “Amazon Women in the Mood” dubbed into French, Italian, Portuguese, and Castilian Spanish. How to Draw Characters offers step-by-step instructions to sketch Fry and Leela. Unlike similar features on sets like King of the Hill, an artist doesn’t directly lead us through the process. Instead, we find stillframe directions that provide the details. It’s moderately interesting, though the funny elements in the screens’ backgrounds are more interesting. Always a consistently good series, Volume 3 of Futurama proves to offer the best yet. The shows come across as solid across the board, with only a smattering of lackluster programs. Picture quality looked simply terrific, and both audio and extras were fairly positive as well. I definitely recommend this fine little package.